The Gonzaga Bulldogs have advanced to the Sweet 16 four consecutive years. They'll go for No. 5 on Saturday when they take on the Baylor Bears in a second-round 2019 NCAA Tournament showdown at 7:10 p.m. ET in Salt Lake City. The top-seeded Bulldogs (31-3) blew past Fairleigh Dickinson in the opening round, while 9-seed Baylor (20-13) bested Syracuse 78-69 to advance. Vegas lists the Bulldogs as 13-point favorites, with the over-under for total points set at 146.5 in the latest Gonzaga vs. Baylor odds. 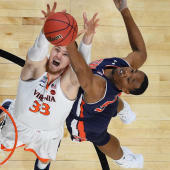 It's the top-ranked offense of the Zags against the defense-first attack of the Bears, so before you make any Gonzaga vs. Baylor picks, you'll want to see the 2019 NCAA Tournament predictions from SportsLine's advanced computer model. Now it has analyzed all relevant data and crunched the numbers for Gonzaga vs. Baylor. We can tell you it's leaning over, but it has also locked in a strong point-spread pick that hits in almost 60 percent of simulations. That pick is only available at SportsLine. The model knows that blowing out Baylor won't be easy, especially if the Bears play as well as they did against Syracuse. They shot 16-of-34 on threes and 53.8 percent overall, while holding the Orange to 41.2 percent shooting. Baylor's 16 made threes against Syracuse's zone defense tied for the fifth-most made in an NCAA Tournament game. Makai Mason hit four of them and scored 22 points. Mason averages 14.9 points, one of three double-figure scorers for Baylor. Mason, along with Mario Kegler (10.7) and Jared Butler (10.2), stepped it up in the first round to combine for 49 points, well over the trio's average. But just because the Bears cruised on Thursday doesn't mean they can keep it within the Gonzaga vs. Baylor spread against the top-seeded Bulldogs. Baylor has a strong defense, but it hasn't met an offense like Gonzaga's. The Zags are the No. 1 scoring team in the nation, averaging 88.8 points per game. They also lead the country in field goal percentage (53.2) and assist-to-turnover ratio (1.76). The Bulldogs also pace the nation in scoring margin (24.2), so while 13 points seem like a lot to cover, the only games that were decided by fewer 14 points were their three losses (Tennessee, North Carolina and Saint Mary's) and single-digit wins over Duke, Washington and Creighton. Against the spread, Gonzaga has covered five straight and nine of 12 against Big 12 competition. Comparatively, Baylor has covered just once in its last seven games. Who wins Baylor vs. Gonzaga? And which side of the spread hits in almost 60 percent of simulations? Visit SportsLine now to find out which side of the Baylor vs. Gonzaga spread you need to jump on, all from the model that has crushed college hoops, and find out.